One of the reasons I love this portrait is because it captures the ostentatious, over-the-top personality of the absolute monarch. With all of that ermine fur, there is no question that this guy is a big spender. And how many people at age sixty-three have enough self-confidence to show off their legs (while wearing high-heels?). You have to admit, Louis Quatorze had guts. I knew that Louis XIV performed in ballets, but I didn't realize that any extant depictions of the costumed monarch existed. Don't you love his peacock-feathered skirt? And the wavy, golden sun rays that extend from everywhere (even his shoe buckles!)? 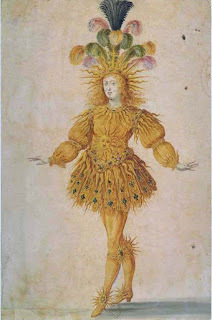 It's no wonder that Louis XIV was given this role in the ballet, since he continually compared himself to Apollo and even called himself the "Sun King." 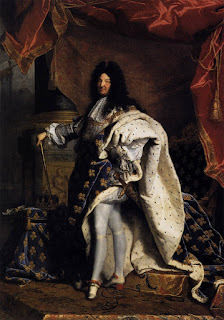 I know that Louis XIV was a incredibly selfish person that did a lot of horrible things to upkeep his vanity and image. But I have to admit, I think this guy is absolutely fascinating. Who can't be fascinated with someone who wears outfits like this?